Kotoko has a crush on Kuro, but with all manner of yokai in the picture as well as supernatural mysteries to be solved, getting these two together might be a little bit difficult in this new supernatural adventure! Kotoko Iwanaga is a frequent guest at her local hospital, and she’s got a major crush on Kuro Sakuragawa, a visitor to one of the patients at the hospital. After two years of watching him from afar, Kotoko finds out that Kuro’s girlfriend, Saki, has broken up with him, emboldening her to ask him to date her with marriage in mind. She finds out that Kuro’s relationship may not have ended due to normal reasons, but she’s got a secret of her own – Kotoko was abducted at a young age and made into a god of wisdom, giving her the ability to see and communicate with supernatural beings known as yokai. While the two may not get off to an immediate romantic start, there are plenty of other ways for Kotoko to cosy up to Kuro as the two strike up a partnership to take on a series of supernatural mysteries together. I generally understood that In/Spectre was premised as some sort of supernatural mystery series, and in flipping open the front cover I more or less prepared myself for a generic action adventure series with minimally developed characters of little interest with a formulaic plot. 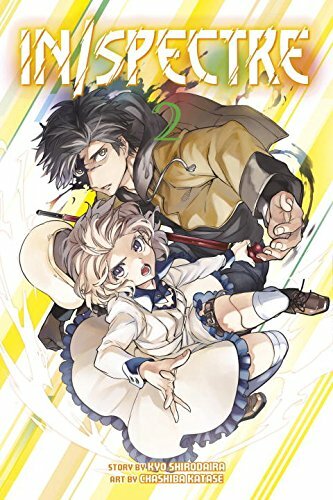 It was to my pleasant surprise to find out that quite plainly, this volume rocks, and I was happy to see it succeed where a lot of other series fail in terms of setting up an interesting supernatural premise with some likable characters. In that sense, In/Spectre Vol. 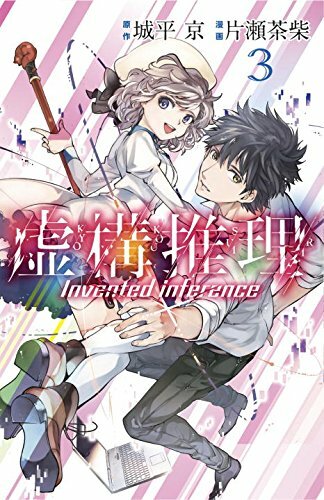 1 does pretty much everything a first volume should do in its two chapters – the first introduces and characterizes Kotoko and Kuro in a meaningful way before showing off a little bit of the world, and the second builds on this in an exciting way by introducing a solid mystery and some good action that held my attention throughout. You’d be forgiven in reading the first quarter or so of this volume and forgetting that anything out of the ordinary is supposed to be going on at all, and the restraint that this volume shows in carefully building up the supernatural elements of its story was one of the most impressive things it did in the early going. Our introduction to the main character, Kotoko, is framed as a young girl pining over the handsome boy visiting the hospital leading up to her fateful little confession to him, and I liked that this served really characterize her as a charmingly forthright character that I wanted to cheer for in the early going. This romantic element served as an engaging undercurrent to Kotoko’s interactions with the other characters throughout this volume, and this early introduction was done quite well in terms of establishing her feelings effectively in terms of her directness with Kuro. As this happens we get the creeping sense that something is a little bit off about Kotoko and the rest of the world as supernatural things are slowly introduced in their conversation to complicate the mix, but what was done so well here was the series spinning this effectively with a sense of mystery to let it play out for the reader rather than revealing everything all at once. Once the cat (or the yokai, rather) are let out of the bag, the rest of the first chapter becomes concerned with developing the mysterious and fascinating backstory of both Kotoko and Kuro before springing them into action to conclude things. We get a little more backstory here about Kuro’s breakup with his girlfriend as well as more about Kotoko’s ability to communicate with yokai, and I thought both of these stories worked really well because they kept a little bit of mystery in play while fleshing out the nature of this world in tandem with their respective personalities a little more fully. Without spoiling too much, this made for a really engaging premise for the beginning of their partnership when combined with the romantic focus introduced by Kotoko’s endearing directness. The two are then put to the test in a requisite bit of action that punctuates this first chapter in a cool way with some interesting twists that made me eager to continue onwards through this volume. 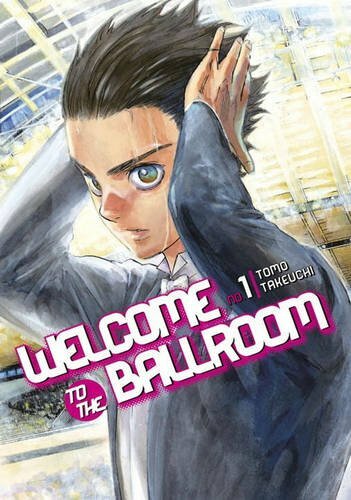 Much like the first chapter purposely keeps readers off-base by taking its time to let the supernatural aspects of this series slowly creep in, the second chapter of this volume again impressed me by taking a completely different approach that I expected. Instead of proceeding with Kotoko and Kuro’s story immediately, the story leaps forward two years to follow Kuro’s former girlfriend, Saki, as she works at a police station on a case that quickly begins to take on supernatural vibes as it develops. Although the reasons for their break-up probably could have been explicated here a little bit more coherently, one of the reasons why this approach worked so well was because it served to flesh out Kuro’s backstory from a different angle by exploring Saki’s ruminations on their break-up. This also linked her history with Kuro with to the mysterious going-ons of this world quite well, and I was impressed with the way this added another layer on to the story and characterization we saw in the first chapter. This is all accomplished within the scope of developing the overall mystery, and I liked that unlike a number of other series, the mystery actually felt, well, mysterious, in more than just a superficial way as we view it through Saki’s frame of mind. The mystery continues to build throughout the second half of this volume before erupting into a really cool action scene as Saki ends up confronting the supernatural head on with Kotoko as she burst onto the scene. The paneling works well her to show the action clearly, making for an exciting fight that served as an enjoyable exclamation point for this volume as Kotoko and Saki collide for the first time. I’ll definitely be interested to see where that dynamic goes after all of the backstory shown in this volume. This sequence continues the trend of the art being fairly strong throughout this volume, and I liked the general cleanness of the lines throughout. The characters are also appropriately expressive, and I thought this really did a good job capturing both Saki and Kotoko’s range of emotions shown throughout this volume. 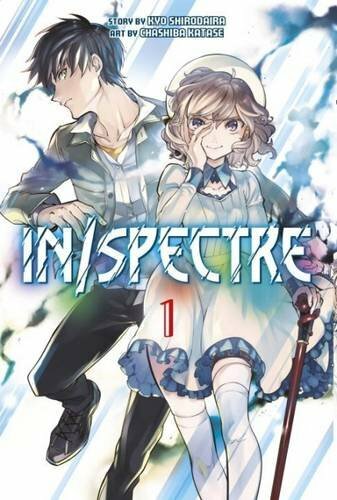 In/Spectre Vol. 1 is an alluring supernatural mystery with a charming romantic twist, and this made for an impressively enthralling read. This series stands out for the way that it takes care in developing an interesting and well-fleshed out set of characters within the scope of slowly building up a sense of mystery in tandem with the supernatural elements of this world. The romantic subplot was definitely a strong addition, and I thought it added a charming tint to Kotoko and Kuro’s early relationship primarily because of Kotoko’s directness. More than that, this series immediately gives us a reason to become invested in all of the characters that are introduced, and I can't wait to see how the mysterious they encounter develop heading into the next volume. 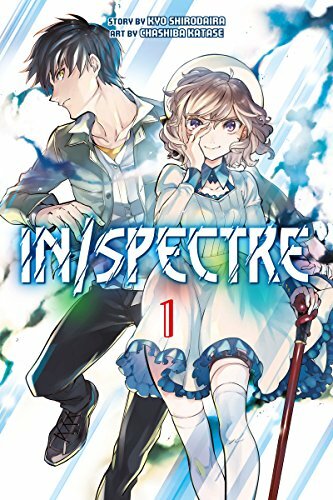 In/Spectre Vol. 1 was released on November 22nd, 2016. Written by Kyo Shirodaira and drawn by Chashiba Katase, the series is currently serializing in Kodansha's Shonen Magazine R magazine. It is translated into English by Alethea Nibley and Athena Nibley and published by Kodansha Comics.